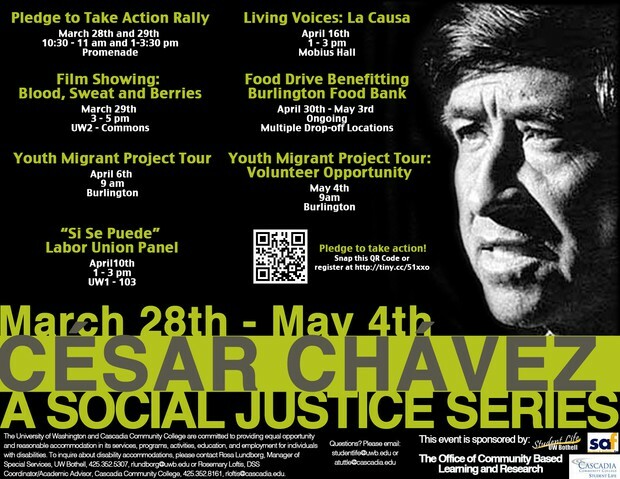 César Chávez was a civil rights, Latino, farm worker, and labor leader; a religious and spiritual figure; a community servant and social entrepreneur; a crusader for nonviolent social change; and an environmentalist and consumer advocate. For more than three decades Chávez led the first successful farm workers union in American history, achieving dignity, respect, fair wages, medical coverage, pension benefits, and humane living conditions, as well as countless other rights and protections for hundreds of thousands of farm workers. Against previously insurmountable odds, he led successful strikes and boycotts that resulted in the first industry-wide labor contracts in the history of American agriculture. Join CCC & UWB to bring awareness about issues pertaining to social justice in community. There have are many people working toward improving standards for workers, immigrants, children, families, etc. We encourage everyone find a way for them to get involved. If you have questions about the series please contact Melissa Watkinson, from the UWB Community Based Learning Department at mwatkinson@uwb.edu.